Well, yesterday cleared up the counts quite nicely. The bullish trade trigger at 1374 elected and from there, the market pretty much traded straight up with zero drawdown. That trigger targets 1408. 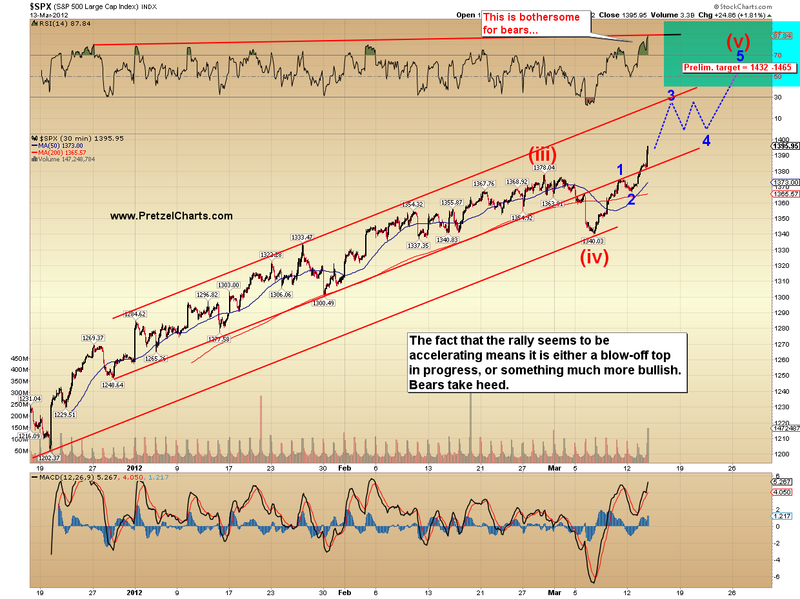 We now have solid confirmation that wave (iv) did indeed complete at 1340. Preliminary targets for (v) are 1432-1465. The dollar also rallied yesterday, proving once again that markets aren't always correlated. Straight to the charts. Since everything has clarified, I can project some likely target zones for each wave. 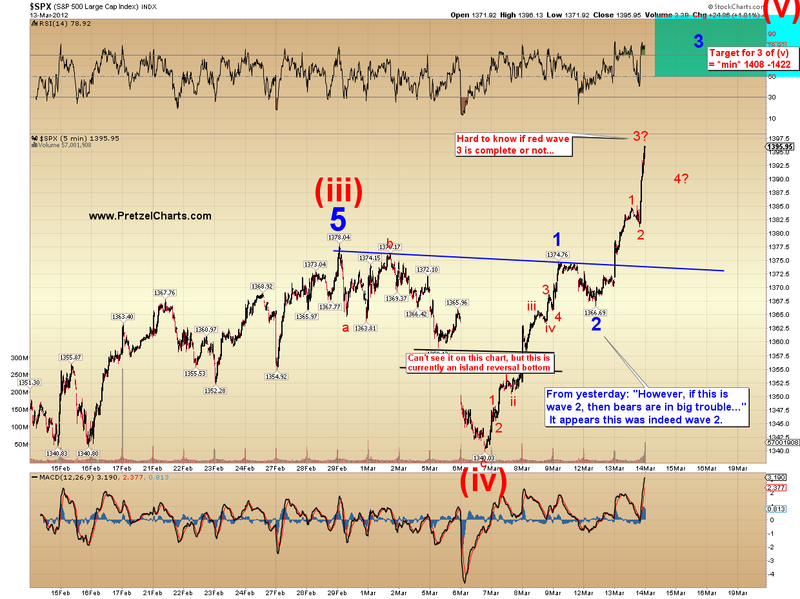 First the 5-minute chart, and the probable target for blue wave 3. Next the 30-minute chart, for context and the larger wave (v) targets. If you'll note the RSI momentum has exceeded any so far produced by this rally. Those looking to short would be advised to take a step back and wait -- moves almost never reverse significantly without first building a momentum divergence. A divergence exists when prices make new highs, but momentum fails to exceed its old high. Currently, no divergence exists, which makes higher prices extremely likely. 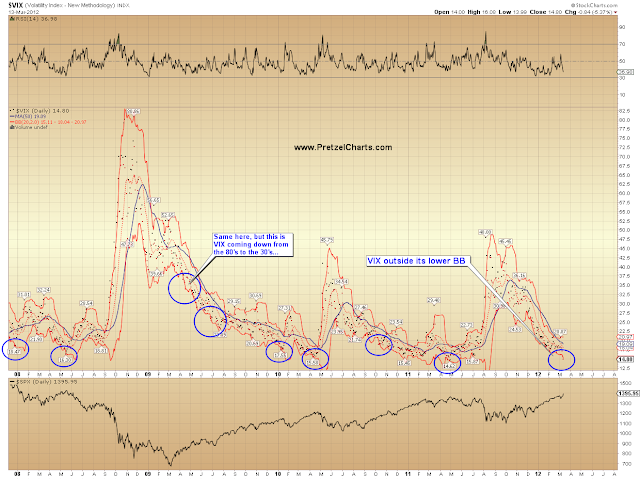 Next, a couple of Bollinger band charts; one of the SPX, and one of the VIX. SPX closed outside its upper Bollinger band, which doesn't happen too often; and VIX closed outside its lower. These signals often indicate that an intermediate top is getting closer. Once again, I do not expect an immediate top here by any stretch -- I expect higher prices first. In conclusion, the move appears pretty straightforward, and while not exactly "anticipated," since the signals were a bit conflicted, it's not at all unexpected either. Once the bullish trade trigger elected, the market declared its intentions and was off to the races without looking back. 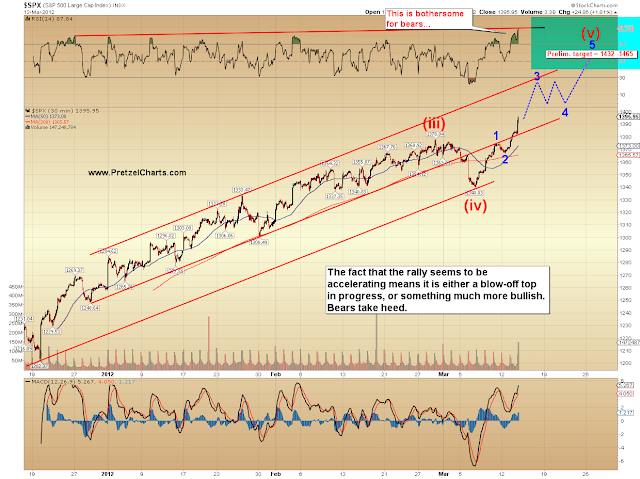 I expect higher prices over the near term, though there should be some 4th wave sideways/down corrections along the way. 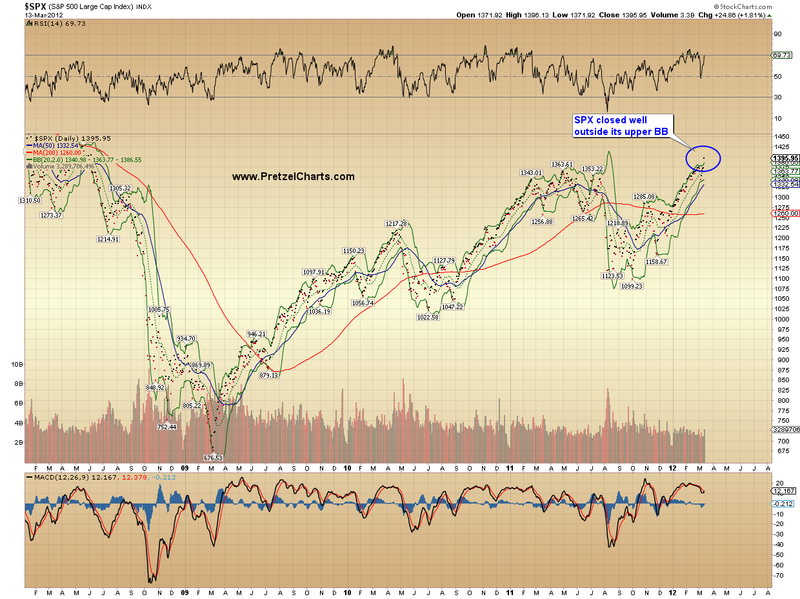 The market's next significant turn is unlikely to come until at least the mid-1400's. After wave 3 completes, targets will become more accurate. My SWAG right now is 1440. Trade safe. morning, PL. Nice snorkel pics. Good evening - great work PL. Thanks. Pretzel, pardon my ignorance, but what does SWAG mean? What would your timeframe be for 1440? Thanks! I would guess over the next couple weeks to a month, but I don't usually do time frames. Price rules all, IMO. Thanks for explaining, that is pretty funny. Dumb question but, what happens if I click the "i'm a troll" checkmark button? You will start using a FLUX program and invent the Super8. Oh wait, never mind. Eyebrows are going up as well as the prices. Your head explodes. That's how I've been limiting the troll population. BWAAAHAHAHAHA! morning PL! good stuff! I am going long on any dip. That's funny, but too true to the trading world. Expect the unexpected. Thank you for your guidance PL. You're like an air traffic controller, or eye in the sky for us neophytes. Weird having the market open at 3:30 a.m. again. It's much better at this hour, I'm still half-awake instead of bleeding from my eyeballs. Just have to get used to having an hour less each day to get things ready. Seriously, maybe AR clicked that button by accident one day, and then was forever more cursed wth Disqus zaps. Very interesting feature. Green count is out. Rally's way too strong for a b-wave, and has retraced too much of a. My usual shift was 3am-3pm....it's the best of both worlds for getting things done except that you really learn to appreciate sleep. I posted the details yesterday. Do you subscribe to updates via email? No, it would be too much clutter. I will read yesterday's thread. I hope PL gets a new discussion format that's easier to navigate. Thank you. RE clutter - I use a distinct email account for this stuff, then just delete the hundreds of email at the end of the day. So try to get a good price to short before 10:00, then turn around and go long at 10:52. Not trading advice of course. AAPL headed for 600 today? Trading DX is *not* for the faint of heart last night/today. I've managed to limit myself to a small loss, but it's been whipsaw city. Probably straight sideways from here. See 2/9 for analogy. TVIX has bounced back up to 13.77. AAPL is on fire on rumors of iTV. AAPL's Chinese contractors inadvertently gave a jaw-dropping preview of the eye-popping gadget. It is going to be another blockbuster. And all along I thought it was the boxes of ritzy promo goodies that he picked up at the Oscars! indeed.. it has some fight.. Anyone able to pull up yesterdays short data on TVIX and UVXY ? the volume was insane . thanks in advance..
Super8 is showing reversal. Get out the short and go long immediately. Not trading advice. The short interest on both TVIX and UVXY have increased significantly, esp. for UVXY. Looking at the info on Barrons.com, which update the short interest every month. By the end of Feb, short interest on UVXY has increased by over 600% and 100% for TVIX (4 Million shares were sold short) I can only imagine that number is even higher now. The day of short squeeze will come, and revenge will be sweet. Those guys have been riding an easy wave since Oct.
Not sure if they will use the iTV, which has a bad rap. The new Apple TV is entirely different and game changing. AAPL's Chinese manufacturers are gearing up for Christmas unveiling. Great post as always PL. and a shift to net job losses in April." Pardon my ignorance Dust Devil, but what are you referring to when you mention 'Super8'? Another great post PL - it seems redundant to say each day, but your calls have been spot on - "BLUE BOXES" anyone! 1. Either decoupling from equities here or pointing the way down - leaning toward a decoupling and deep correction but time will tell. 2. First "crude" chart is of gold over the past 4 years. Gold seems to be following the path of the 34% correction back in 2008. That test of the 300 day average back in December, seems to indicate a retest of at least the 300 MA - so a date with $1600 could be in order. A convincing break there and Wowza! 3. Another chart is the ole' Dow/Gold ratio from the past 12 year bull run. what strikes me is that over this time as the ratio has been ratcheting down, the bounces up from lows have only violated the previous bounce back by very miniscule amounts. I say this as we sit out about 7.85 (a close at the current levels would push that level closer to 8) and the previous daily high close on the last rebound from lows was 7.94. I would maybe give it 'til a slight tick above 8.00 and then something has to give. As a bull gold nuthead this certainly raises an eyebrow here. 4. And finally (I know you guys are happy) is a long term Dow/Gold chart. I strongly still believe that the gold bull is not over - however, this does not mean we aren't due a correction back to the healthy trendline (circa 1974-1976) before a larger gold run or who knows, maybe it'll end - say it ain't so! Anyway, thanks for indulging my craziness here, not really making any conclusions merely saying that my interest get perked up at these levels. Apple is now bigger than the entire Us retail sector. Very interesting piece. Thanks for pointing this out. jbg, I remember you saying you had some UUP. Might want to watch that carefully here. If the dollar can't hold onto 80.50, watch out for a fast trip back to at least 79.50ish. It's just off the high for the move, but I think that *might* be it for now. If it can create a material break of that high, all bets are off, but I'm thinking ending diagonal 5th wave here, prolly all done now. thanks for the insight, I think I'll hold onto my long APR 12 SLV 30 puts a little longer then. Super8 is breaish and since it's past 10:52, time to quit long and go short at ES 1389. Got whipsawed there. Thanks PL. I will watch. I went long UUP as well. I see UUP that it had bounced off the 50 SMA (resistance) on 2/6 and 3/7 (pretty much spot on). Broke through on 3/9. The SMA is now 22.19, current UUP at 22.40. Im thinking of putting in a stop loss at 22.15, in case the 50 SMA acts as support. I realize UUP is a derivative of DXY and using the 50 SMA is pretty simple analysis, but the market did respect the correlated DXY price as resistance twice since mid Feb, so Im thinking this could be a good way to let the position run, but get out virtually even . What do you think is the target for this gold correction? No, I've been reading Pretzels daily post for a while, but never read any of the comments until yesterday and today. Thanks. If not, it's a nest of 1's and 2's. Very difficult to get a read on at the moment. PL...I am amazed at the accuracy of EW analysis and principles. Citigroup's first wave down bottomed at $36.76 on June 8, 2011. The third wave down bottomed at $21.40 on October 4, 2011 and now this fourth wave ascent has topped out (at this time) at $37.72 yesterday....four cents away from a violation of the first wave extreme. It's like the wizard behind the curtain. Mercury retrograde: Fakeouts - TA is inaccurate due to inherent faulty assumptions. *If* the dollar can hold this breakout, then it could be off to the races. A nest of 1's and 2's can sometimes look like an ending diagonal. Now you're talking. I thought we had a full five finish this morning. UVXY up more than TVIX due to the premium. Whoever picked this up at 23.7ish this morning is smiling now. whole number tends to be psychological support also, right? Are PL and you referring to the dollar or SPX? PL...based on a previous discussion with you regarding 30 year T-Bond futures.....the measured upside move of $155 would be removed at what breech of the current triangle? Wave a low, or violation of the bottom trendline of the triangle? Shocker? NO! Someone tells what we have all suspected and he will get madee into a trouble maker. Neede more people with balls! In a true Elliott triangle, wave e should never break wave a. So a break of the wave a low would indicate it wasn't a triangle, thus all bets would be off. Re: second chart from yesterday....so you are saying that yesterday's action was red (v) -- all the way in the upper right corner? Dually noted...thanks. $133.00 (+/-) it is. Some how able to get back to -1.6 after holding shorts for 2 days. Went long and almost back to BE. Serious stress out just to be BE. My foggy cracked magic 8 ball says 1407-8 tops out then turn begins. CNBC reported possible power struggle in China, nothing concrete but Commies nervous. If this is what they do to their clients, think about what they do to the public at large through their market making and trading desks. That's a big fat MAYBE, so don't go letting the horses out of the barn just yet. Greg Smith should be commended. He should start his own asset management firm. IS the 1407-08 area a possible top with EW? Or do things not flow that way with recent move up? PL...one last question today. I've heard the axiom "the flag flies at half mast" and it appears that GAZ is sporting such a flag. If the axiom is correct, does that suggest GAZ could double in price from it's current $5.00 ???? Meaqns time for more Viagara! Sorry, couldn't resist. Already posted on last thread by Furrrr. Itz kool...just asking...just clarifying this feeble mind. But it does feel like I'm forcing that count a little - would still work better with one more push up. Big Jim and the twins share your sentiment! Thanks. Just sold my TF longs, +2, but looking to get back in. He's welcome at my dinner table. No, it implies it could go to about 8.40. You would use the price measurement of the first move and add it to the breakout point -- if you're trying to apply that particular axiom. More conservatively, one would measure the triangle width (about 1.97 in that case) and add that to the breakout point for a target. I don't like my 2-7 but as Jim Carey said in Dumb and Dumber "so I might have a chance". lol -- "So you're saying I've got a chance!" Yep, pretty much as enigmatic as Uncle Buck right now, just in reverse. Didn't have the guts to stick with my short there - oh well, initial target was reached, move on soldier! WHat you said. I have only seen movie 50 times. AAPL target price was up'ed by MS to 720 and maintained that it could hit 960. Weekly Calls are going to infinity. Thank you again for all your great work. Another great article. Was wondering what your take on SLV is given this morning's action. 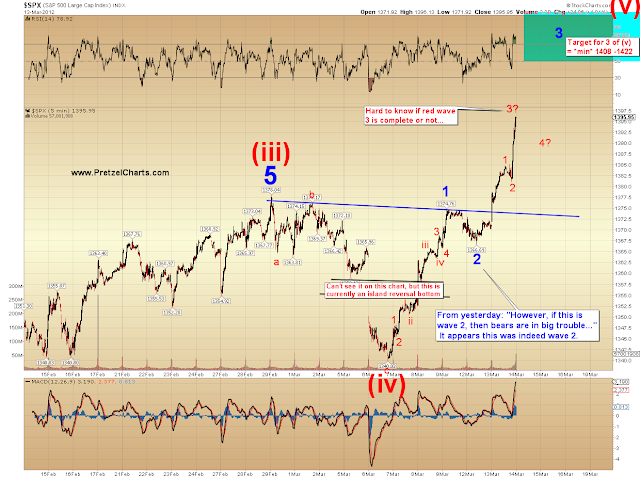 Until earlier this morning, I thought we were in wave 2 of 1, after the higher wave 2 completed at 31.5. Now it seems we may have just completed a double zig zag?? Not sure though; counting corrections is still quite a challenge for me. Any insight would be appreciated. lol -- is mine actually right? I've actually only seen it once. Maybe one and a half times, if I watched it again on cable. Silver looks pretty ugly at the moment. If that head and shoulders works out, it could head a lot lower. 1380 cash? or is that plus 6.5 for cash? That actually reminds me of something I've been meaning to ask someone. What's a good rule of thumb for when to move from one futures contract period to the next? I was seven days to early with my bull run, but that movement - its inner structure - what we see now, is what I thought possible. And, it is like a weather ballon, up to the sky. right now it broke the clouds and some time it will go up... but then the ballon will burst and send the lego spaceship down again. But until then to da moon. There is a consensus date to roll over from the nearest to the next nearest contract. It is not mandatory, so really, there is not cast in stone rule. But for ES, it is the Friday before the expiration Friday, minus one day, so it's the Thursday. It rolls at the 8:30 Central Time session - in other words, it begins at that time - on that Thursday. My son came in and saw this... guess what I get to do this weekend. Downside... I have to find one of those balloons... upside, it will clear some of the Lego's out of the house! That would hit your 61.8% retracement, right? Excellent idea....can I send ya some. Alright, time for me to get some rest. All work and no sleep makes Pretzel a dull boy. this might be the start of the mid aft. move down (ST) I mentioned earlier. truly, it came so fast and without the help of my usual indicators I missed it. you are now removing/altering your posts, you took out no break, no short? Are you thinking abc for a iv or more, katz? "Our pets heads are falling off!" previous post "watching for potential mid-afternoon down move, tgts 1380, then possibly 1371 ESM2" plus perfectly timed contrarian call. It has nothing to do with bullish calls, it has to do with ethical unabridged comments changed to alter comments, hiding wrong posts. ugh, I finally decide to put stops on my shorts after the morning drop, come back to the computer and see them triggered followed by the market dropping back down. Its like everytime i set stops, they're like magnets for the market. yup buy any dip to 1380. gluck. Where mah yacht at? Oh, dat's right - it's in the shop. I am already out. I don't like the way the VIX or VXX is acting. was away and saw AAPL went parabolic almost hit 600, now on its way down, is it the final blowoff top, or more upside to come? UVXY is all over the place today, 15 cents move in seconds. Shorts are covering for sure. It is up 2 times more than TVIX, well to be fair, when it was down it was sometimes more than 2 times TVIX too.... Let's see if it can get to $27 today. If we don't have a stock crash soon, the bond market might crash first....dilemma dilemma for the FED, I guess you just cannot have both ways, thought they should have known this long time ago. Yes, I'm watching TLT. Just hit 111. Below 110, in danger zone. Below 105, here we go! Furrrr, this is based on your 1 minute chart with my yellow line showing about when you posted. This is what I was looking at. IMO the 1 minute will throw you curves, I like the 3 or 5 minute better. It tells a better story. Just trying to help. Thanks. I agree - I usually back out and look at 3 and 5 minute because the pattern becomes more "obvious." I was charting the 1 minute because that's what PL uses to capture those small five wave moves for the 1 wave etc. If the economy is "said" to be improving and downside risks are "said" to be solved, isn't it normal that bonds would sell off as everyone searches for growth in stocks? What is normal? What constitutes a crash? Is this what you mean by SPX going parabolic? doesn't look parabolic to me. Usually it takes TLT a long time to move 5 points. However, TLT has dropped 5 points since Monday this week. IMHO, with the Greek default / CDS triggering last week, banks have been dumping PIIGS debts along with other government debts like Treasuries. They need to recapitalize to absorb the losses on Greek debts and to position for potential losses with the rest of the PIIGS debts. Usually, during the first leg of the bond market decline, money will be rotated into other assets like stocks. But during the next leg of the decline, people would tend to sell off everything. Take a look at the bond market crash of 1994 and you'll see that relationship with stocks and gold. If & when the bond market crashes a modest 20%-25%, it involves a huge amount of money because it's about 4x-5x larger than the stock market. If it's gonna crash this time, the negative impact may be unpredictable because interest rate is practically at zero and therefore there is no room for soft-landing the crash. Wow, don't watch the market for a day and it goes crazy. I am opening small long IT position to capture rest of wave (v), will add more in coming days/weeks. 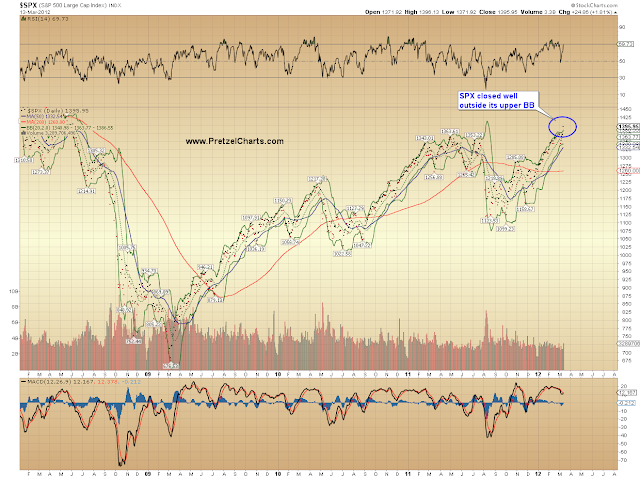 We will see spx 1430 before we see 1360. Am still short Eur, think that is a good IT/LT trade, Eur/USD will be 1.20 in a year, if not sooner. Europe way sicker than USA, even if Greece / Portugal manage to stay in Euro. All is IMO, not trading advice. AAPL is in FULL parabolic mode. 600 seems likely for tomorrow. The question is what happens then? That's great! The sooner it flies and crashes, the better for all of us. I want it to crash by April. Then, everybody will be scared and stop losses will be triggered everywhere.